An electric hoist is a lifting device that is typically mounted overhead to a beam or gantry. Electric hoists can be fixed in one location, or use a trolley to slide along a rail or beam. The winch consists of an electric motor attached to a gear mechanism that spins a drum. Around the drum is a wire cable with a hook attached on the free end. An electric control box typically hangs down from the hoist, allowing the operator to raise and lower the load hook by pressing a button. Electric hoists are differentiated by load capacity, voltage requirements, lifting speed, cable length, and mobility. Although electric hoists are usually used for industrial and commercial purposes, they can also be used residentially. A good example of an electric hoist found in the home is a garage door opener. By the way, if you are in the market for one be sure to check out our review of the best garage door openers. Electric hoists and electric winches are very similar in operation, but there are some important differences between the two tools. The greatest difference is how the braking system for each devices operates. Most winches mounted on Jeeps and 4×4 vehicles utilize a dynamic braking system that uses resistance in the winch gears to hold the load. This type of braking is not suitable for suspended loads, and using a winch that way could lead to slipped or stripped gears, resulting in a dropped load. Unlike winches, electric hoists utilize a mechanical brake arrangement, in which a physical brake – rather than the hoist gears – lock the suspended payload in place. This both protects the lift gears and also prohibits line bleed. 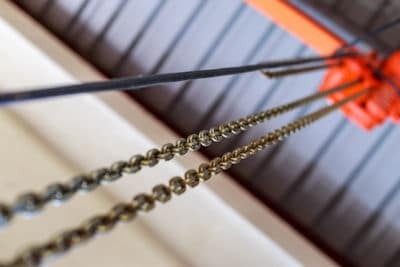 Another difference between the two devices is that electric hoists do not offer a free-spool mechanism. Winches need this so that the operator doesn’t need to hold a button to extend the winch line, making it easier to spool out and attach the cable. Winches, on the other hand, forego the free-spooling option, eliminating the risk of the operator accidentally dropping the load in free-fall. And many electric hoists come with a switch that cuts off the hoist if it attempts to lift a payload that weighs more than the unit is rated for. There are some brands of electric winch that are constructed to also operate as a hoist. But to do that, the manufacturers have to remove the free-spool function (or at least allow it to be disabled), and add in a brake system that locks without using the gears. Unless your winch is specifically labeled for double duty as a hoist you shouldn’t attempt to use it that way, as doing so is dangerous to the user. Industrial electric hoists come with a variety of mounting options to meet the needs of different applications. Among the most typical are lug mounted, trolley mounted, hook suspension. And less common custom setups are also available if the job calls for it. For trolley mounted electric hoists, the units mount on an i-beam or on a track. The benefit of a trolley mount is that the hoist can be positioned and used at any point along the beam or rail. Electric hoists that use a lug mount configuration are built with bolt holes that attach to threaded lugs, or come with the lugs attached that mate with corresponding bolt holes on the attachment point. Some lug mounts are built to work in conjunction with trolley systems. Hoists with a suspension hook mount need a hook on top of the unit that attaches to a mated hook hung from the ceiling or crane boom. When setting up an electric hoist and mounting it, make sure that the devices that attach to your loads and the structures that support the hoist are strong enough to support the weight of both. For safety concerns it is always better to have the hoist, mounts, and supports be over-engineered to handle the load to prevent mishaps.